If you want to get users and authors last login date or time then you easily can. If you have a WordPress site with registered users and authors then you probably want to display their last login date in your WordPress admin area where you and your authors can check the last login times. So in this Quick WordPress beginner tutorial you will learn how to show users last Login Date on your WordPress website. On the WordPress website you can easily display your users last login date with the help of the plugin. Which is very easy to add just in one click you can display your user's last login date. There many WordPress plugins which can help you to show your user's last login date in your WordPress admin area. One of the plugin which we will use in this tutorial is "WP Last Login" WP Last Login is simple and fast plugin to display your users or authors last login date. 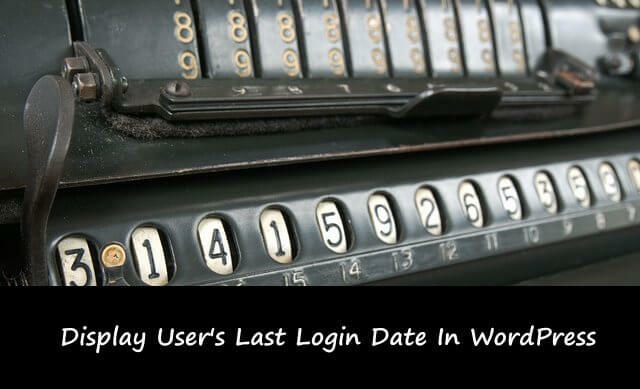 This plugin stores your user's login date and displays in your WordPress admin area by adding a new column to your Users Overview tab with the date of your user login. This plugin also available in many different languages. Displaying the users late date inside in your WordPress admin area is easier. Like as I said in just one click you can display the users last login date in your WordPress admin area. All you need to do is download and install the "WP Last Login" WordPress from your WordPress plugin tab. if you don't know how to do it, then read the article which wrote on How To Upload & Install WordPress Plugins (3 Methods). Once you have installed and activate the plugin, then you will see a new field in your Users tab called "Last Login Date" with the dates of your users. First time you will see ‘never’ instead of date once your users logged in and out, then this plugins will store and display users' dates. We hope this quick WordPress beginner tutorial will helps to your store and display your User's login dates. If you liked this tutorial and learned form it, then like and follow us on Twitter, Facebook.